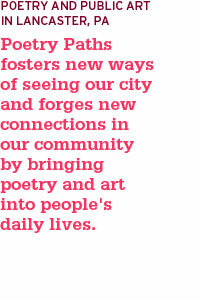 Come Celebrate Poetry Paths at the Lancaster Public Library! 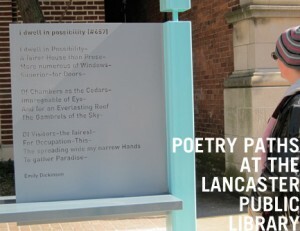 On Friday, March 2 at 5 pm, Poetry Paths will join the Lancaster Public Library to mark the installation of this artful bench by SALT Design Studio and collaborator Brooklyn-based artist Erin Gleason featuring the poetry of Emily Dickinson. Guests at the event will include the Library’s Executive Director Herb Landau and Community Relations Coordinator Heather Sharpe and the other members of the two selection committees who chose the poetry and art: Cordelia Moyse and Stacey Youcis, Friends of the Library, and Pedro Rivera, Superintendent of the School District of Lancaster. Students from the Writers House, including our Poetry Paths interns and students who led a creative writing workshop at the library last fall as part of a community-based learning course at Franklin & Marshall, will join our staff to represent Poetry Paths. Laura Howell of the People’s Shakespeare Project will read the Dickinson poem, and artist Sara Pevaroff Schuh of SALT Design Studio will be present to say hello and take questions. Guest of honor Congressman Joseph R. Pitts will conclude the brief ceremony.